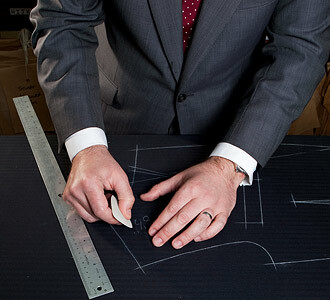 The Savile Row Bespoke Association - protecting and developing the art of bespoke tailoring on Savile Row. The Savile Row Bespoke Association was founded in 2004 with the aim of protecting and developing the art of bespoke tailoring on Savile Row. Today, the Row continues to flourish – the home to more than a dozen bespoke tailoring businesses, employing over 100 working craftsmen that form the centre of a unique community in London’s West End. Savile Row is a community that not only creates a unique English luxury product, but one that also forms the training base for young craftsmen and women who will go on to become tailors or designers themselves. In the general interest of member firms, ensuring that the mark ‘Savile Row Bespoke’ is neither abused nor devalued. Savile Row Bespoke Ltd is the owner of the Trademark. The mark is a collective mark. Further information can be obtained from the Association’s lawyers Olswang. The Savile Row apprenticeship scheme is the form of in house training and accreditation for Savile Row Cutters and Tailors recognised by the SRBA. Working to promote the art of bespoke tailoring and to represent the interests of retailers and tenants of the Row whose businesses are sympathetic to the aims of the Association. The Savile Row Bespoke Association has drawn attention to planning issues that are detrimental to the Row and the measure of care needed to maintain a working craft industry in Central London. Favourable press comment has reminded the public that bespoke tailoring is a home-grown and successful luxury industry, bringing vitality and originality to a great city. To protect and ensure the future of true British bespoke tailoring, the Savile Row Bespoke Association has defined the strict quality criteria and manufacturing standards that are upheld by member firms. The Association board meets regularly and welcomes applications to join. Establishing synergies with weavers, suppliers and subcontractors. Facilitating discussion to ensure the future of the industry. In 2006 the Savile Row Bespoke Association members convened to establish a method of identifying garments specifically made by the Savile Row tailors who meet the association’s required specifications. From this the Savile Row Bespoke label was launched, which all the members now include in their work to formally denote a genuine Savile Row bespoke garment. Made by hand, using skills that the modern world considers archaic or lost, Savile Row suits are simply the best suits in the world. The Savile Row Bespoke Association protects the art of bespoke tailoring and works to ensure that the well dressed man will always consider Savile Row to be his spiritual home. The Association is a place for discussion and consultation about collective problems of concern to the members. The Association acts as spokesman for the industry with local and national government services and trade unions. Working with local government, United Kingdom and International organisations to maintain and develop London’s unique position as one of the world’s great cities and home of male elegance. Savile Row typifies the values of London. It has a heritage of over two hundred years; it has a rich mix of style, craft and individuality and an international reputation. Westminster Council and the Central London Partnership have now declared policies of active support to maintain Savile Row as the international home of bespoke tailoring in central London.